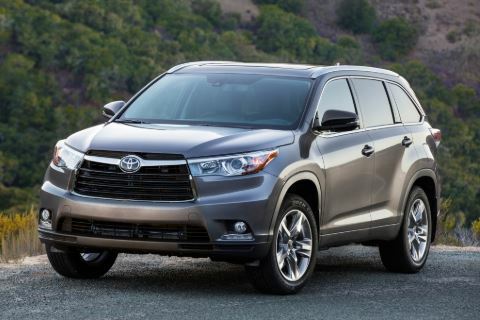 Japanese designers have awarded Toyota Highlander 2014 an aggressive appearance, the front part of the car with a vertical trapezium grille, (like a Toyota Tundra pickup), narrow, high-tipped headlights, a huge front bumper with miniature fog eyes and strokes of daytime running lights (LEDs). The frowning and formidable form of the crossover emphasizes the hood with characteristic longitudinal ribs, which further increases the already huge false-radiator grille. On the side, the car looks like a giant – powerful and at the same time heavy-weight wheel arch scraping, large doors, a long hood, a flat roof, a huge forage. Even the ribs, splashes and waves that abound in the side surfaces are not able to create a harmonious appearance. The back of the car is simple and unpretentious, but functional and practical. A large, correctly-rectangular luggage compartment door provides easy access to the trunk, large dashboard lights, a lean bumper with an overlay of un-dyed plastic. 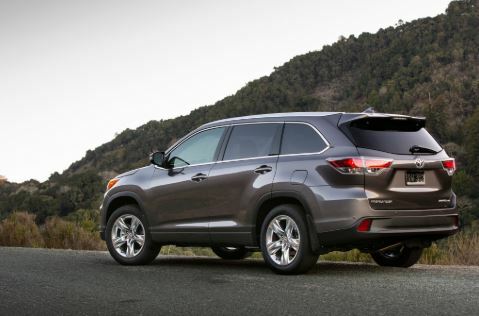 Toyota Highlander 2014 began to look like a car designed exclusively for the North American market – big, formidable and awkward. The salon of the new Highlander is able to accommodate up to 8 passengers including the driver. The landing of three adults on the third row was achieved thanks to an increase in the width of the rear compartment by 11 cm due to a change in the architecture of the rear suspension. Instead of MacPherson struts, a compact multi-lever is now installed behind it. Armchairs of the third row provide a comfortable fit, a place on the width, above the head and for the feet is enough. There appeared a new multi-functional steering wheel, a modified combination of instruments and a 4.3-inch color multifunction screen, the smooth lines of the torpedo are stylishly complemented by an original shelf at the bottom of the front panel. On the central console of the base version, a 6.1-inch color touchscreen is organically inscribed, responsible for configuring the multimedia equipment, phone and auxiliary functions of the car and providing output of navigation maps and images from the rear view camera. Specifications of Toyota Highlander 2014-2015: for the new Highlander two petrol engines are offered, and also a hybrid version of the crossover. The four-cylinder 2.7-liter engine paired with the automatic transmission 6 automatic is installed on the car with front-wheel drive FWD. The 3.5-liter V6 (273 hp) comes with a new 6-speed automatic transmission and is mounted on a crossover with AWD and Dynamic Torque Control (controls and redistributes torque along the axes), it is possible for the US market to order a powerful engine for a front-wheel-drive crossover . Hybrid Highlander is equipped with a petrol 3.5 V6 with electric motor and CVT variator. Suspension is completely independent: the front pillars of McPherson, rear on double wishbones, brakes of all wheel discs, electric power steering is applied. Passenger safety is entrusted to 8-pillows, ABS with EBD and BAS, anti-slip system (TRC), VSC, HAC and downhill slope (DAC). In general, an adult, well-executed car.